When homeowners across South Florida encounter various situations that result in a broken glass window repair Pompano Beach Fl, they immediately realize the potential hazard and security risks that are associated with it. Whether it is the sharp edges of the glass or the possibility of burglary, a broken glass window or sliding glass door repair demands immediate attention and action for a swift glass repair. Incidentally, inexperienced individuals themselves should not attempt to repair glass windows or sliding glass doors. In order to ensure a sturdy and risk-free repair, one must rely on the professional services of a good glass repair company Pompano Beach, Fl. However, the selection process for these companies can often be daunting, especially when residents or business owners have not faced a similar situation in the past. The following section explains key considerations that customers must pay attention to, before they finalize their decision of a handing their glass repair project to a glass repair company Pompano Beach FL. During your hunt for a glass repair expert Pompano Beach FL, you must review online sources and customer reviews to ensure that you select a company with highly skilled and fully trained staff. Another tip to make sure that you find a truly professional glass repair company Pompano Beach FL is that you should initiate open communication with the representatives. You must only trust a glass repair company Pompano Beach FL that offers transparency of information about their material selection. For example at Express Glass & Board Up Service we offer a 5 year warranty on the quality of the high impact glass and a 10 year warranty on the insulated units. Customers could request a certificate of warranty upon request. Once you acquire knowledge on the types of material options the glass repair company Pompano Beach FL has, you must conduct a quick research on each material. This is how you can be confident about the quality of the materials. When looking for a residential glass repair service in Pompano Beach or a West Palm Beach commercial glass repair service, homeowners and business owners should not confine their search to the services offered by various sliding glass repair companies Fort Lauderdale FL. It is equally important to find an option that charges reasonable rates which are compatible with your budget. This is why Express Glass & Board Up Service offers Free Estimates and an Instant 10% Off. Another key concern of homeowners and business owners who are seeking glass replacement Pompano Beach FL by a professional Pompano Beachi glass repair company is based on its past records. One of the most effective ways to find this information is through the recorded testimonials by its previous customers. You can review Express Glass Testimonials as well as local reviews found in google places and google+ pages. A quick overview of these important factors can guide you to a good decision for a glass repair company Pompano Beach FL. The Florida city of Pompano Beach, located in the northern portion of Broward County, lies along the coast of the Atlantic Ocean about 8 miles north of Fort Lauderdale. Centrally located in Florida’s famous Gold Coast, the city is situated approximately midway between Miami and Palm Beach (about 35 miles away from each). Pompano Beach is serviced by both Interstate I-95 and the Florida Turnpike. Named for a species of fish (pompano) which swims abundantly in the area’s warm Atlantic waters, the city was originally inhabited by the Tequesta Indians, who survived on the subtropical land by living in villages near the ocean and feasting on its abundant sea life. European colonization eventually led to the destruction of the Tequesta way of life, and the Tribe was replaced in the area by the Seminoles. Until the arrival of the railroad in 1896, the region was not linked to the rest of the nation but after this time the municipality grew and the city of Pompano became incorporated in 1908. 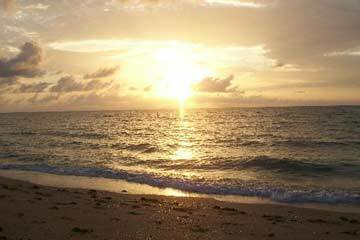 In 1947, Pompano officially merged with the beach area to its east to become the city of Pompano Beach. The city today relies on tourism, light manufacturing, retail, and high technology as its principal industries. Beach goers, fishermen, and golfers find living or vacationing in Pompano Beach a dream come true. Over three miles of white pristine beaches combined with an abundance of some of the world’s most beautiful and challenging links just minutes away make it easy to see why thousands of visitors flock to the area annually. In addition to an almost unlimited supply of outdoor recreational options, the city also hosts a number of annual events and festivals, including the Pompano Beach Fishing Rodeo, a week-long May event attracting anglers from around the world who participate in one of the largest sport fishing tournaments in south Florida. December’s Holiday Boat Parade features prizes and awards for “best dressed” boats and also includes a ride down the Intracoastal Waterway featuring food, drinks and fun. Among the city’s other attractions are the Pompano Beach Amphitheatre, an open-air venue which has served as host site for numerous outdoor concerts. Also in town is the Goodyear Blimp Base, home base of the famous blimp and one of only four blimp bases in the world. Bargain hunters should head to the Festival Flea Market Mall, housing more than 800 stores, booths and kiosks selling discounted brand name merchandise. Two miles north of Pompano Beach is Lighthouse Point, home of Hillsboro Light, a decades-old lighthouse which is the brightest in the southeast. Those whose fun consists of spectator sports won’t be disappointed with the Pompano Beach area. The city offers year-round horse racing at the world famous Pompano Harness Track. In nearby Miami, baseball fans can migrate to Pro Player Stadium, home of Major League Baseball’s Florida Marlins. Football fans can follow the exploits of the Miami Dolphins as they host the NFL’s best, while fans of indoor sports can take in some major league hockey (NHL’s Florida Panthers, who play in nearby Sunrise) and basketball (NBA’s Miami Heat). Call Now and Get A Free Estimate and Instant 10% Off! !